On Thursday, September 14th the school held its annual Years 11 – 13 Prize Giving in the school hall. The welcome speech was delivered by Mark Armstrong and Anna Thompson Head Boy and Head Girl. 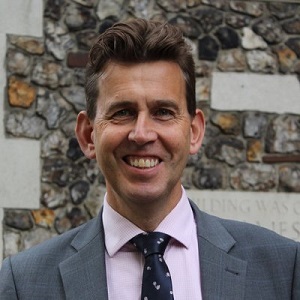 The Guest of Honour was The Revd Nigel Genders, The Church of England’s Chief Education Officer, who presented the prizes for the academic year 2016 – 2017. Some Faculty prizes were the first to be presented. The recipients were introduced by the Head of each Faculty who explained why the students had been chosen. The prize for English at KS4 was awarded to Rosie Castle and the English prize for KS5 was won by Megan Cammidge who also received the History prize. Next came the prizes for Expressive Arts. Among the prize winners were Sarah Howden for KS5 Drama. Sarah has assisted in directing many school productions. The prize for Music at KS5 was awarded to Esme Porter, a talented musician who also received the St Cecilia Shield for Practical Musicianship. The prize for Performance in a School Production at KS4/KS5 was awarded to Andrew Gray. 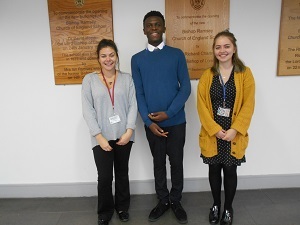 The Year 11 Form Prizes followed and among the recipients were Amie Sullivan and Nathan Atakpu-Obi. Nathan was also awarded St Lawrence Church Prize for Resilience. The next group of prizes came from the Humanities, Mathematics and Modern Foreign Languages Faculties. One notable prize winner was Paul Treadaway for Government & Politics at KS5 who gained A* at A level. Mr Jeffries then introduced the winners of the Commitment Award which is given to students who have given outstanding service to the school. Among the Award’s recipients were Fleur Mahdessi-Sarkissian who also gave a stunning performance of Adelaide’s Lament from Guys and Dolls at the end of the prizes presentation; Fleur performed the character of Miss Adelaide in the school’s recent production. Another recipient was the Head Girl, Anna Thompson. Following these awards were prizes for Religious Education, Science and Social Studies. Apart from academic success the school also recognises Outstanding Contribution to School Life for which a number of prizes were awarded. However, exam results are also important and prizes were obviously awarded for Academic Excellence and students were awarded for the Best Results at and A Level. Finally prizes were awarded for Outstanding Achievement. Among recipients were Paul Treadaway who won the Barnabas Prize for willingness to support and encourage other students. This prize comes from an anonymous donor and is given to a student who, without seeking the limelight, is a source of support and encouragement to his or her peers. Another notable winner was Sophie Dowson who won the Mike Udall Prize for Outstanding Achievement in PE – Sporting Performance. Mike Udall was Headteacher of the School from January 1992 until August 2002. During the course of the proceedings the audience was entertained by guitar player Glen Taylor who performed Spanish Guitar. Mr Wilcock gave his Headteacher’s Report which included a Malosa Report ( a school in Malawi supported by the school) presented by the Head Girl. A Vote of Thanks was given by the Head Boy. The evening concluded with the singing of the hymn Lord of all hopefulness and the Final Blessing from Mrs Susy Dand, Chaplain.